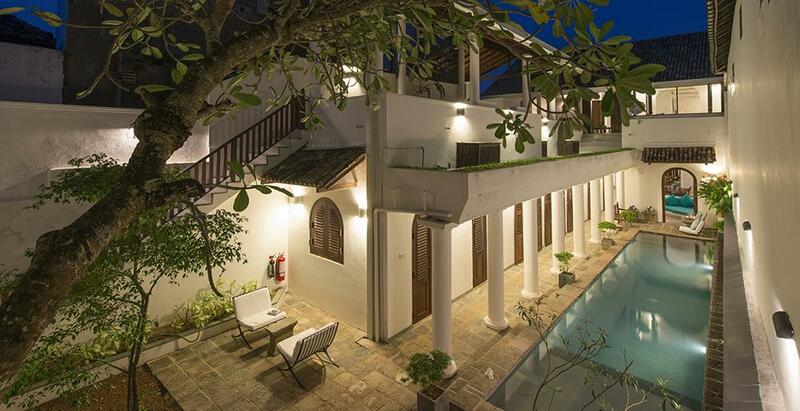 Houses in Galle’s historic seventeenth century fortress tend to hide their expansive interiors behind deceptively modest facades as carefully as secrets remain hidden for hundreds of years, and Ambassador’s House is no exception. Although the property’s pillared frontage and arched doorways are strikingly elegant, they are not particularly large. Step across the threshold however and be amazed at the generous proportions of the living room alone; and this awe-inspiring combination of magnificence and grace, ambiance and charm offer a tantalising taste of what’s to come as you surrender to your curiosity and step further inside. Villa 1370 dates back 300 years and significant remnants of its eminent past remain; soaring ceilings, pillared verandas and graceful archways combine with a contemporary-colonial interior design that harks back to the Dutch, under whose authority this magnificent property (and indeed the fortress in which the house stands) was built. Until recently, the building was the much-admired residence of the Bangladeshi ambassador, hence its name, and its spacious interiors were quite aptly used for the entertainment of visiting dignitaries. Today, it is with traditional Sri Lankan hospitality that our staff team welcome you; keen to cater to your every requirement we’re sure their warm welcome will make you feel immediately at home. Villa 1370 is well suited to group gatherings and large families as the amount and variety of sumptuous living space on offer – from the expansive living room and roof terrace to the intimate TV room and master bedroom lounge – allows everyone either to find their own quiet and peaceful corner or to enjoy the spacious rooms together. 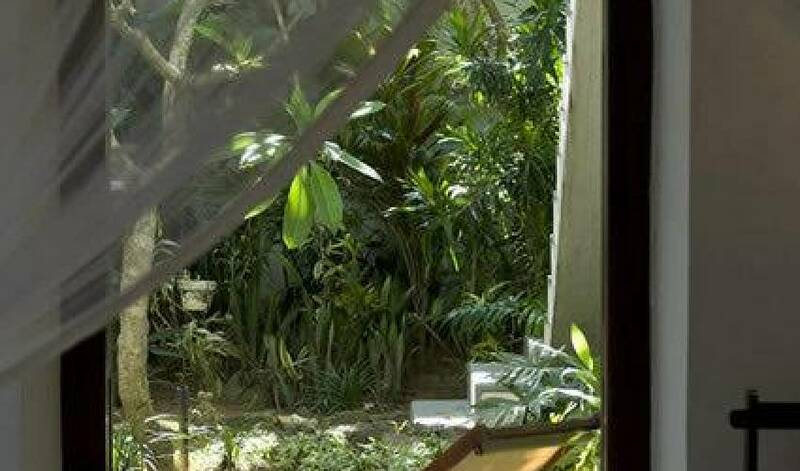 The house comes with a gorgeous courtyard plunge pool enhanced by a cascading wall of water that gushes quietly in the background and echoes softly amongst the petite pockets of tropical gardens. 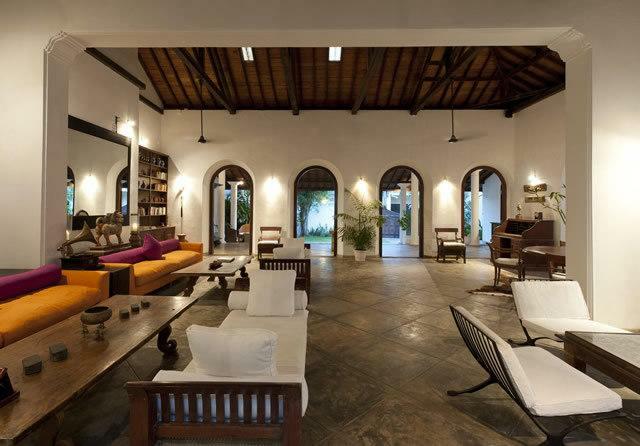 Atmospherically tucked within Galle’s historic seventeenth century fortress on the southwest coast of Sri Lanka, Villa 1370 is a magnificently proportioned five-bedroom property bursting with colonial charm. 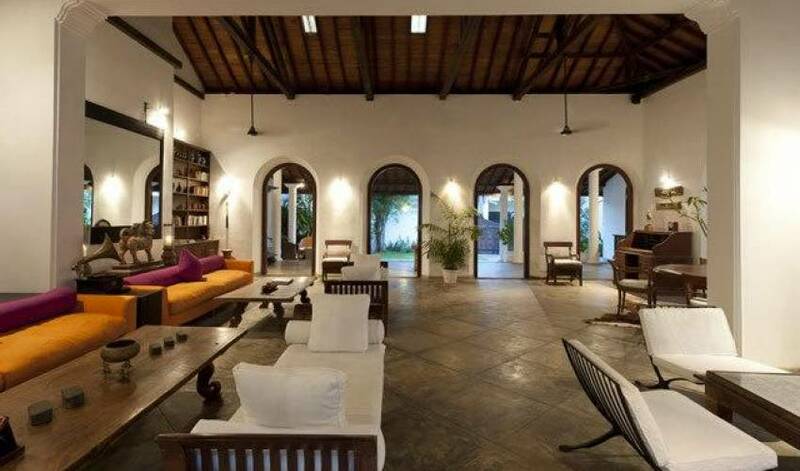 Once the residence of the Bangladeshi Ambassador, this majestic house boasts an abundance of living space, including a spacious roof terrace and a cavernous lounge, which make it an exceptional place for entertaining. 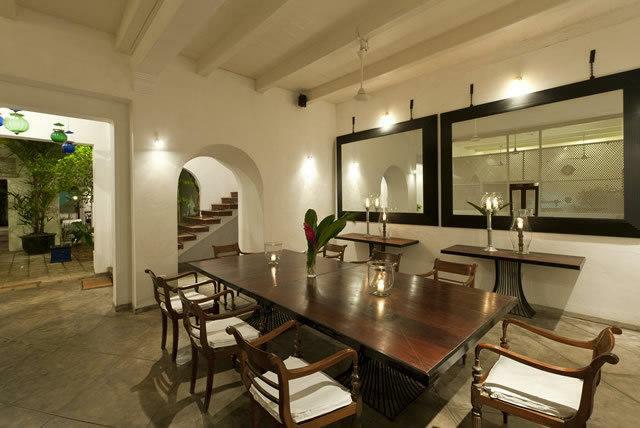 Families and groups of friends will cherish time spent in these elegant surroundings soaking up the nostalgia. The house is fully-staffed and comes with an elongated plunge pool, wireless internet and a satellite-enabled TV and DVD player. 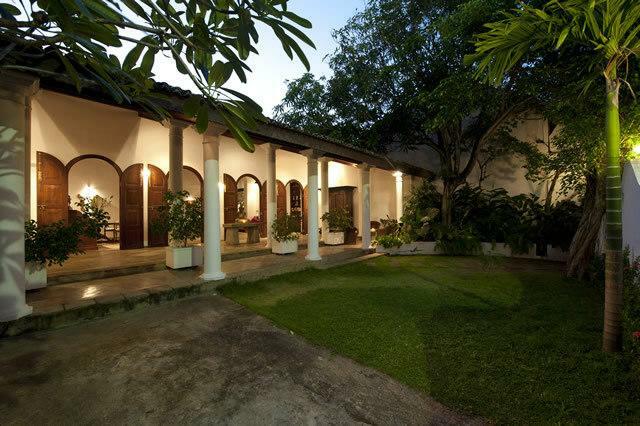 An elegantly curved gateway from the fort’s historic Lighthouse Street takes you across a grassy front garden to reach the deep pillared veranda of Ambassador’s House. 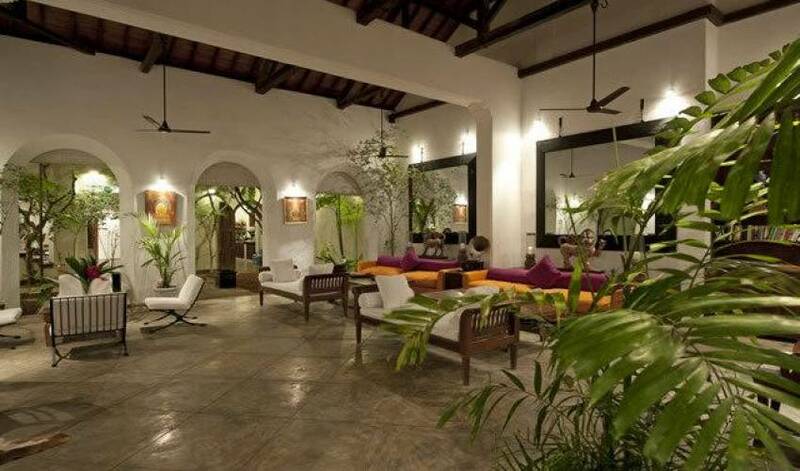 The property comprises two generously proportioned buildings connected by a lush palm-shaded courtyard that merges them seamlessly together. The single-storey front building consists entirely of living space whilst the air-conditioned bedrooms and dining areas occupy the two-storey building situated peacefully towards the back of the house. Three ensuite double bedrooms open directly onto the pool whilst the master bedroom and twin are situated on the first floor with direct access onto the roof terrace. All five ensuite bedrooms at Villa 1353 come with both air conditioning and ceiling fans, whilst beds are dressed in the crispest cotton sheets and shrouded in soft linen mosquito nets. Bathrooms are brand new and have been beautifully finished in smooth terrazzo. Each comes with a hot water rain shower and single sink except that of the master bedroom who’s ensuite features a moulded tub, twin sinks and his-and-hers showers. 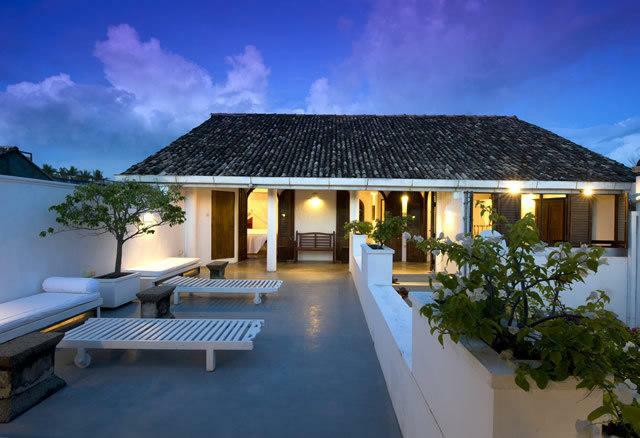 The largest of Villa 1370 five beautiful guestrooms, the first floor master bedroom comes with its own private living space and direct access onto the expansive roof terrace. Featuring soaring ceilings and polished timber floors, comfort comes in the form of a four-poster king-sized bed and rattan planters' lounger whilst for convenience there's an antique wardrobe and collection of table and chairs that look longingly out over the roof terrace to the plunge pool below. Boasting a soaring ceiling, polished timber floors and direct access via an intimate private veranda to the sundrenched roof terrace, this airy first floor bedroom comes with a pair of four-poster double beds, an antique Dutch wardrobe and a big storage chest. 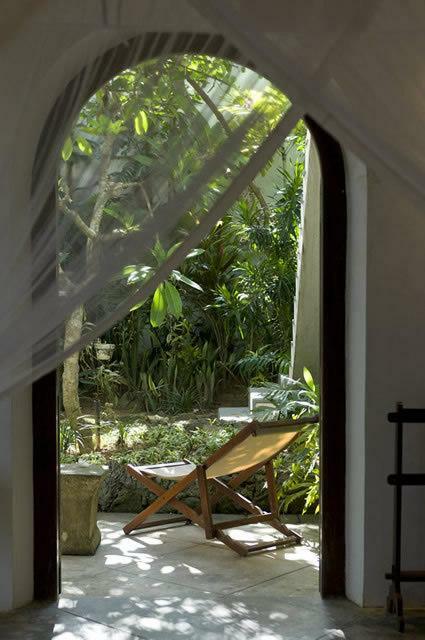 Opening through pretty archways onto the 11 x 4m plunge pool are three double bedrooms. Tranquil and light, each of these bedrooms comes with a king-size four-poster bed and Dutch-style wardrobes. Villa 1370 offers a wealth of living and dining space spread over two floors both inside the property and outside in secluded spots on the veranda, in the flower-filled inner courtyard or atop the expansive sundrenched roof terrace. From quiet tucked away reading corners to sumptuously furnished living and dining rooms designed for entertaining in style, Villa 1353 can be as intimate or convivial as you choose. Expansive yet elegant, this sumptuous living space spills invitingly onto the deep front veranda; it’s easy to imagine what a favourable impression this majestic room would have made on the distinguished guests entertained here by the former ambassador. Furnished with eye-catching tangerine and aubergine-coloured sofas situated beneath two huge mirrors and opposite a pair of timber coffee tables and a duo of cream day beds, this beautiful high-ceilinged room also features a writing desk and a circular table with four chairs. Ceiling fans whirl gently overhead, an old gramophone player provides a touch of nostalgia whilst in a quiet corner, looking longingly through a pair of archways to an inner courtyard garden, sit a clutch of softly cushioned Barcelona chairs. This graceful room at the heart of the house is dominated by a wide glass-topped table for eight overlooked by two huge mirrors suspended from the back wall. Nestled beside it is a fully-equipped black-marble-topped kitchen with centre island, oven, blender and plenty of storage space that’s hidden from diners by a timber latticed wall. Intimate and airy, the TV Room boasts splendid views over the elongated plunge pool to the rear walled garden beyond. Furnished with a built-in sofa topped with soft white cushions, this fan-cooled lounge comes with a 42-inch screen TV enabled with satellite channels and a DVD player. Our personable staff team are dedicated to providing you with the best care possible from the minute you arrive so that you feel immediately at home. 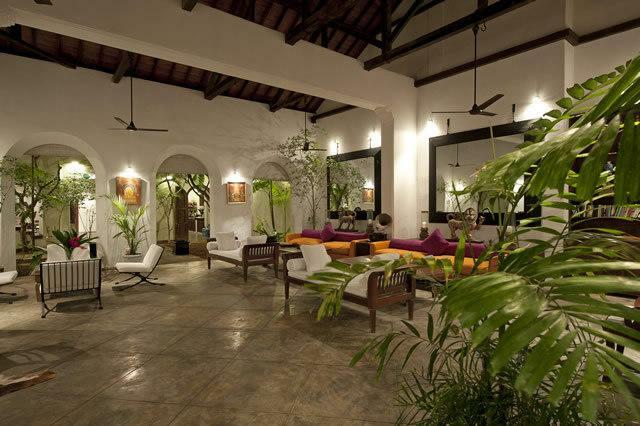 Recruited from the local area of Galle they tend to you in the traditional Sri Lankan way and take the time to satisfy your needs and expectations 24 hours of the day. One villa manager : The villa manager (who lives offsite) is in charge of overall villa operations and staffing, and is on call to fulfill your individual expectations and preferences. One cook : Trained in local & international cuisine and in charge of the market shopping and preparation of guest meals. Two maids : The two ladies of the house speak English and are in charge of the housekeeping, cooking and laundry. They also act as waitresses and are in charge of shopping for daily provisions. One houseboy : Our friendly houseboy lives-in and assists the maids around the house whilst also being responsible for tending to the garden and pool. Security : The property is manned 24 hours a day by Villa Staff and Security. During your stay at Ambassador’s House, savour the delights of Sri Lankan and Western cuisine freshly cooked by our villa staff. On the menu for breakfast is always a profusion of fresh tropical fruit whilst the villa’s sensational coastal setting means that seafood and fish are available in abundance. Light bites for lunch include soups, salads and sandwiches whilst for dinner we’ll indulge you with a sensational Sri Lankan rice and curry spread that’s guaranteed to be a highlight of your stay. On your arrival at the villa, please inform our staff of your likes and dislikes, special dietary requirements and allergies. An initial chat with our cook will give you an idea of the range of dishes she is capable of and we recommend you chat to her each morning after breakfast about your daily requirements to allow the staff time to provision and prepare. You are welcome to self-cater if you would prefer; our staff will assist you in the kitchen or leave you to your own devices, whichever suits you best. Breakfast is included in the villa rate whilst for all other meals the villa operates a kitty system. We ask that you provide a float for the staff who will then purchase all of the provisions – including soft drinks, beer and local spirits - at cost price with a small charge for transport. Receipts will be provided either daily or at the end of your stay according to your wishes. A small selection of wine and international liquor can be bought locally, however if you have any favourites we recommend that you purchase them from duty free when arriving at the airport to avoid any disappointment during your stay. A driver and car can be arranged with advance notice for airport transfers, local tours and onward travel. Please inform our staff of your travel plans and they will arrange a vehicle for you. The expansive living and dining space in Ambassador’s House coupled with its beautiful architecture and wonderful ambiance make it a wonderful place for hosting informal drinks gatherings and dinner parties of up to 25 people. Contact us to learn more about what we can offer and how we can assist you in organising your special event. If you’re in need of some pampering and don’t wish to leave the privacy and serenity of the house our staff will arrange for a trained masseur to come to the property at a prearranged time at your request. 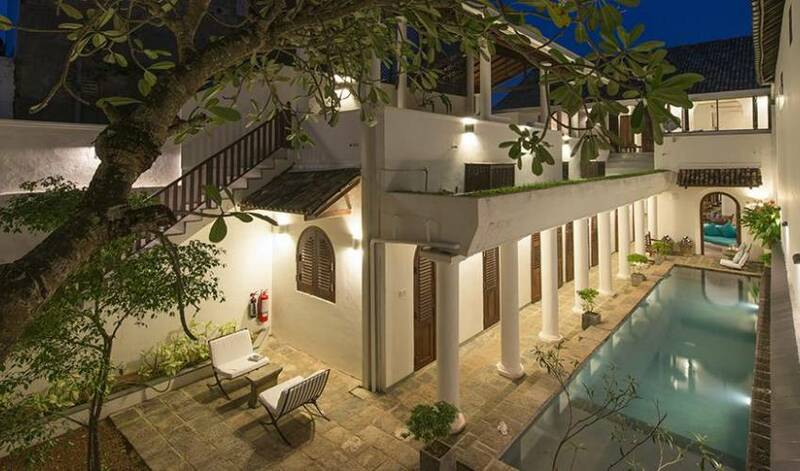 Seemingly timeless, a stay within Galle Fort’s richly historic walls is an honour as you join the glittering ranks of merchants, traders, colonialists and foreign nationals, who have all left their indelible mark on this seventeenth century Dutch fortress. Narrow streets bearing English and Dutch names lead past an astounding concentration of colonial properties whose delicate fretwork, magnificent columns and ornate plasterwork are a constant source of amazement. Walks atop the grassy western ramparts at sunset are a highlight for many; watch cricket matches, couples stealing private moments together and kamikaze jumpers launching themselves into the sea below. 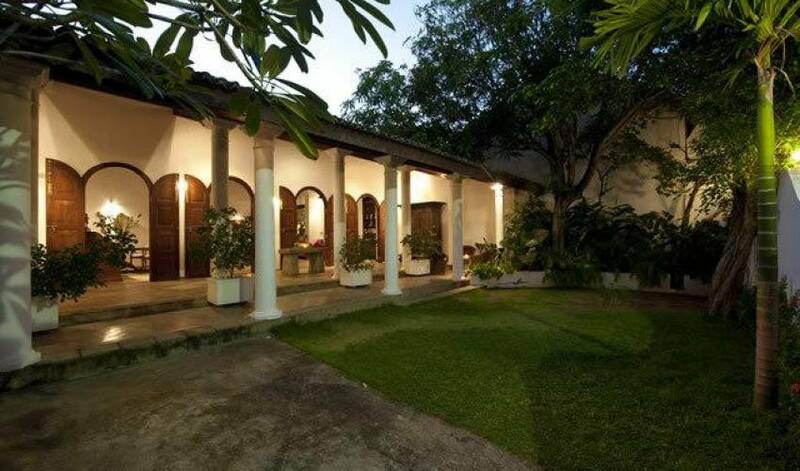 Museums showcasing the fort’s rich history plus a number of restaurants and boutiques are all less than a ten minute walk from Ambassador House’s front door. Location :Galle Fort, South Coast, Sri Lanka. Neighbourhood :An historic 5 minute walk to most of the fort’s prime attractions including the ramparts, the lighthouse and the Maritime Museum. Banks, boutiques and a scattering of restaurants and cafes are also located within the fort, all of which are on your doorstep. The nearest beach at Unawatuna is a 15 minute drive. Capacity : 12 people [1 master suite; 1 twin doubles; 3 doubles]. Living areas :Spacious fully-furnished sitting room; indoor dining for 10; outdoor dining in courtyard garden for 6; fan-cooled TV lounge; roof terrace pavilion with built-in sofa seating. Pool :4 x 11m plunge pool. Staff :Manager (offsite), cook, maid and houseboy (masseuse and babysitter on request at additional charge). A caretaker lives to the rear of the property. Dining :Basic western dishes and Sri Lankan cuisine. Requests accommodated (including special diets). Communication :WiFi broadband internet access, landline for local calls (charge for international calls). Entertainment :42-inch flat-screen TV with satellite connection, iPod adaptor, DVD player, CD stereo, books and board games. The teardrop-shaped island of Sri Lanka is diverse, enchanting and mysterious. Famed for its picture-perfect palm-fringed beaches, its lush rainforest, its misty mountains, its tea-carpeted hillsides and its arid rock-strewn plains, Sri Lanka offers something for everyone. The island has a rich history and many visitors are drawn as much by the world heritage cities, the fascinating temples and the stunning legacies of the European colonialists as they are by the island’s tranquil, predominantly Buddhist, way of life. Wildlife is another huge draw since Sri Lanka’s many national parks and reserves are home to abundant flora and fauna including leopards, elephants, bears, crocodiles and birds whilst out at sea it’s possible to see turtles, whales and dolphins all in the wild. Sri Lanka has numerous beaches where water sports such as swimming, snorkeling and diving can all be enjoyed as well as plenty of meandering rivers and expansive lakes that are particularly beautiful to explore at sunset. The island has many antiques shops, chic boutiques and handicrafts stores plus lots of excellent spas, many of which practice the ancient Indian system of Ayurveda. Restaurants serve a range of international cuisine predominated by fresh seafood as well as the island’s own fiery specialities. Sri Lanka’s climate varies from region to region and is governed by two opposing monsoon seasons. From November until April the tropical southwest region and hill country enjoy their driest periods with hot sunny days and balmy nights accompanied by infrequent rain showers. Between these dates comes the monsoon period which sees a lot more rainfall but rarely full days of overcast skies; May, June and October are typically the wettest months in the south west. For the north and east of the island the pattern is reversed, however since these areas are arid much less rainfall falls during the monsoon season compared to other parts of the island. The Hill Country, although affected by the south west monsoon, typically sees a lot more rainfall throughout the year due to its elevation, with January to March seeing the freshest weather where nights may even be cold enough for a log fire. Humidity tends to be worse at the onset of the monsoon. 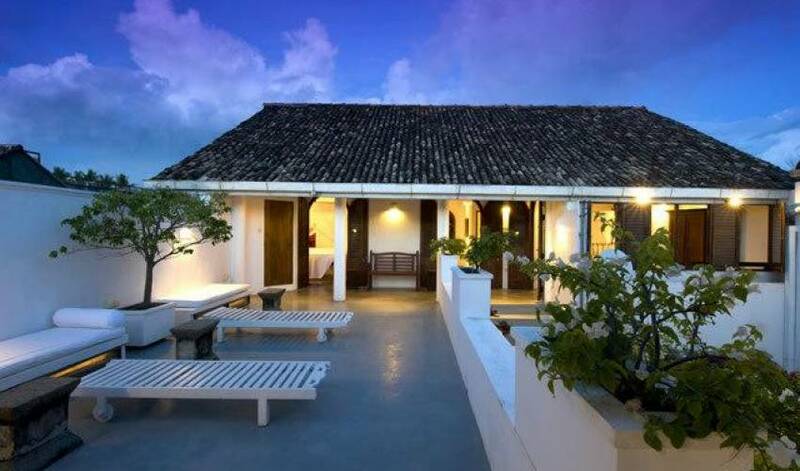 Experience the living museum that surrounds you by taking a relaxing wander around the fort’s charming backstreets; stop and chat with locals, admire the fort’s many heritage buildings, visit the growing collection of boutiques and finish off by watching life playing out on top of the ramparts at sunset. Take a trip into Galle town to take in the multi-sensorial spectacle of the fish, fruit and vegetable markets and browse the colourful roadside wares of peddlers on its buzzing Main Street. Visit Unawatuna Bay for a relaxing bathe on a curve of milky white beach. Many rustic restaurants, coffee shops and bars can all be found here and they all offer a little diversion from the warm turquoise sea. Hidden well away from the road and below the mystical Rumassala Hill is secretive Jungle Beach where you can enjoy snorkelling and relaxing all to yourself just a five minute drive from Galle. Take a scenic bicycle ride through the emerald green paddy fields with Idle Tours. Enjoy the ride at your own pace and gain a unique perspective of village life. End up at the beach with a glorious cool down swim. Yatagala Temple, just inland from Unawatuna, is an ancient Buddhist temple that’s best visited on a full moon holiday when white clothed devotees flock here clutching prayer flags and bunches of flowers. Head to Koggala in the late afternoon to embark upon a boat trip atop the glorious lagoon to look for birds, visit spice gardens, watch fishermen and experience the sun setting over the water as you slowly meander this picturesque waterway just 12km from Galle. Also in Koggala is a turtle hatchery that the kids will love. For a small fee you can admire the resident turtles and even watch as the hatchlings are released into the sea. The late Martin Wickramasinghe, a famous local author, was once a resident of Koggala. You can now visit his old home in town which has been made into an interesting folk museum. Around 20 minutes drive from Galle is a tea factory, whose tea leaves are the closest of any in Sri Lanka to the sea. Handunugoda Tea factory is not only famous for its black tea but also for its white tea which is some of the world’s most expensive. Any tour of the factory includes a tea tasting session and a slice of homemade cake. Eat Out! 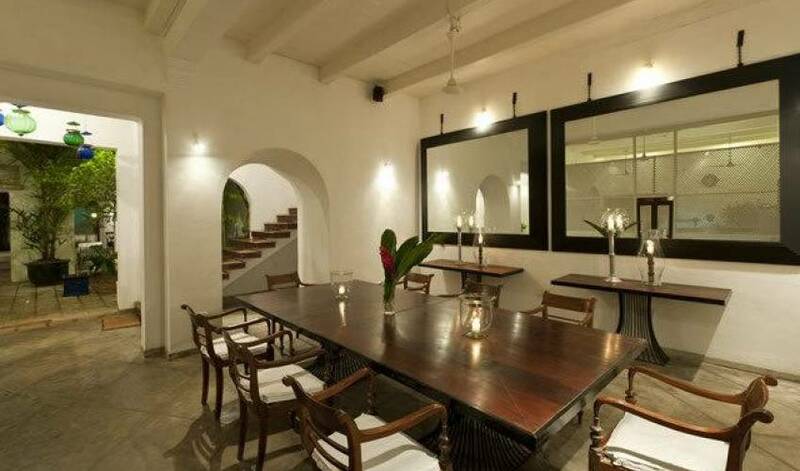 Galle Fort has many great restaurants including Amangalla and The Galle Fort Hotel, both of which are great places for sunset cocktails. Other atmospheric eating spots in the fort include Pedlar’s Inn Cafe and Mrs Khalid’s for excellent rice and curry. Another excellent restaurant on its own little beach is Wijeya whose new rooftop bar is an excellent spot for sunset cocktails. The menu is reasonably priced and very popular with local expats.